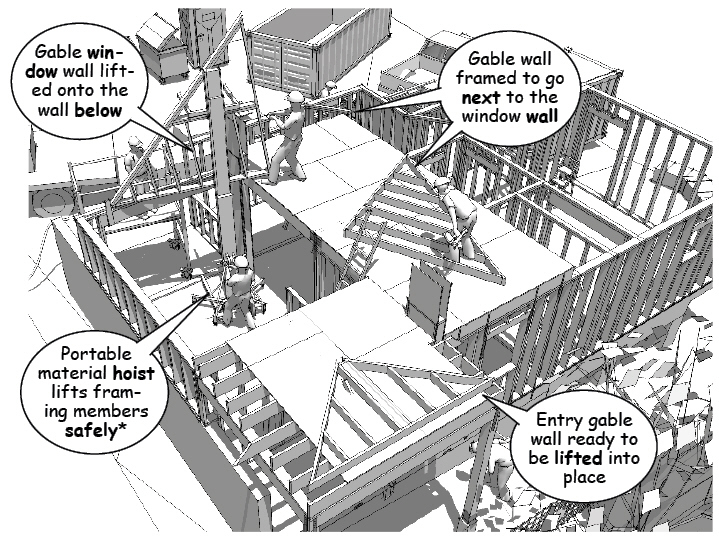 The availability of standard milled framing materials, structural connectors, and skilled carpenters makes traditional wood framing the obvious choice for most types of residential construction. 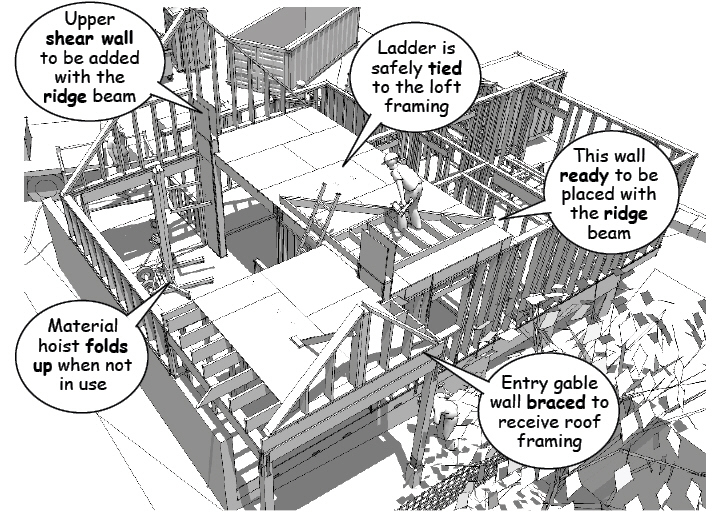 Wood framing resources include print publications and online information common to an industry of contractors, subcontractors, and material suppliers. In this example, the ridge beam column supports are built into the gable walls at each end of the open ceiling. The walls are framed so that the sloping top plate matches the height and slope of the roof rafters. When floor space is limited, the walls are fabricated on the lower level and lifted with a portable material hoist that can be rented from most equipment rental companies, see http://www.genielift.com for specifications and information. The gable walls are set to vertical and stabilized with braces or framed into adjacent shear walls so that they remain ridged and in place while the main ridge and header beams are lifted into place. 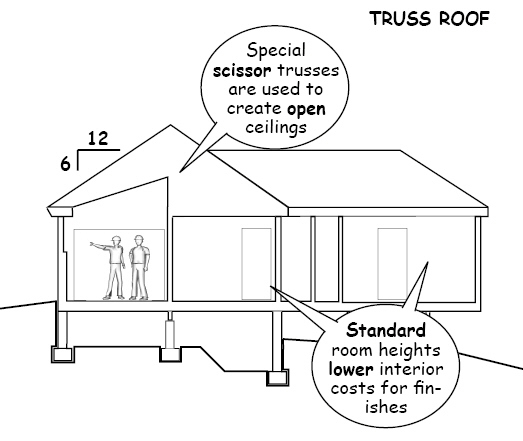 The structural integrity of a wood frame house is also easier to inspect and maintain. Most of the connectors and straps required for tie down can be installed after the floor and wall framing are complete. 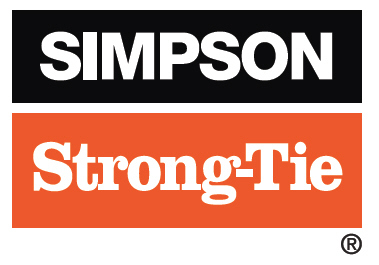 The size and placement of structural connectors varies with location and building loads. As a structural system, construction began with the installation of securely anchored pressure treated sills. The floor joists are then strapped to the sills and the foundation walls and the walls strapped to the joists. Interlocking top plates then tie the walls together to create a solid structural frame. Once the walls and connectors are in place and inspected, exterior sheathing is installed with nails spaced according to code requirements. The sheathing further stabilizes the frame prior to beginning the roof framing. A conventionally framed roof is assembled in the field using off-the-shelf materials. 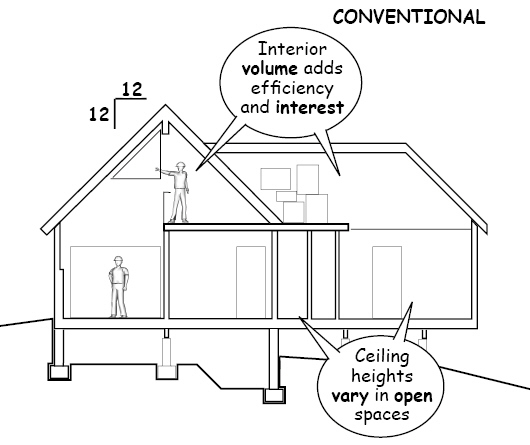 The key advantages are found with smaller houses where reduced labor and faster production have less of an impact and are not a primary consideration (Note that predesign requires careful detailing and coordination with mechanical, electrical and plumbing systems).